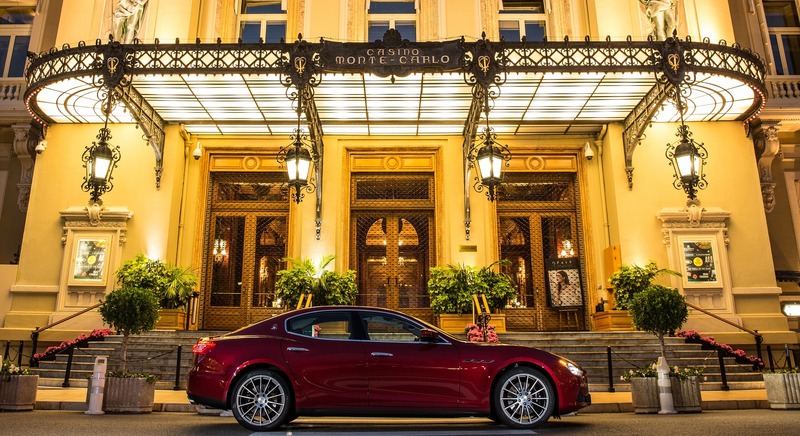 Sculpted forms, fluid volumes and clean lines form a uniquely stylish sports sedan that is unmistakably a Maseratily stylish sports sedan that is unmistakably a Maserati. With the renowned Maserati Q4 intelligent all-wheel-drive system, the Ghibli S Q4 delivers remarkable grip and traction in adverse conditions, along with the highest levels of performance. For 2018, Ghibli is available with GranLusso and GranSport trim, each comprehensively equipped according to your own personal preference: GranLusso emphasizes luxury and comfort, while GranSport delivers an even more dynamic driving experience. The interior of the GranLusso offers Comfort seats with extensive 12-way power adjustment and a memory function for instant access to preset configurations. Additionally, there is the choice of either full premium leather or Ermenegildo Zegna Silk Edition upholstery, both beautifully complemented by Radica open-pore wood trim. Interior features include Sport seats with 12-way power adjustment and memory function, a Sport steering wheel with satisfying grip and integrated shift paddles that add excitement to gear changes, plus purist Inox Sport foot pedals that add direct involvement to every drive. The GranSport also includes convenient parking sensors and, importantly, the flexibility and enhanced handling dynamics of Maserati’s Skyhook suspension system. In the spirit of true Maserati grand touring, the Ghibli cabin is characterized by elegant Italian style brought to life with luxurious materials and finishes, carefully hand-crafted by artisans in the finest Maserati tradition. Perfectly organized and generously proportioned, the Ghibli interior becomes your personal haven, every day and on every drive. The sumptuous leather-finished curves, the clean, technical purity of the dashboard and detailing in metallic-effect dark mirror trim simultaneously relax and heighten the senses. Two side panels converge toward an elegantly simple central structure that houses the traditional Maserati clock with its blue face and aluminum detailing. 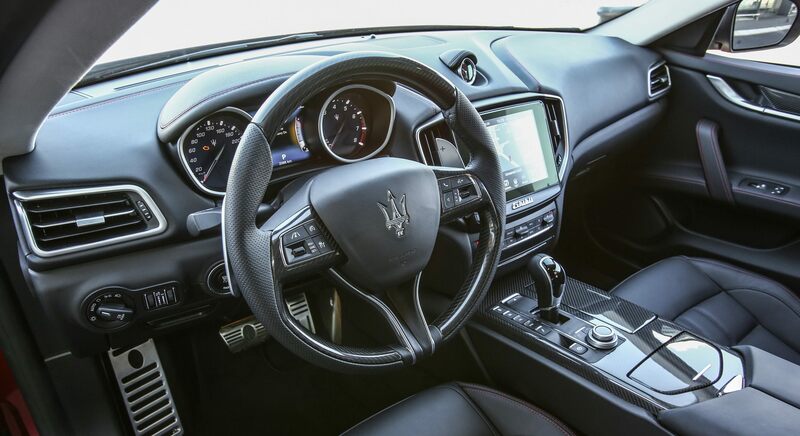 Beneath that is the 8.4-inch Maserati touchscreen infotainment system with rotary control, in addition to a convenient storage box for mobile phone and accessories. Even with its head-turning lines and coupe-like proportions, the Ghibli offers class-leading front legroom, as well as comfortable head and leg space for rear passengers. All seats are upholstered in fine leather that is meticulously selected and finished. In the finest tradition of Italian craftsmanship, stitching is performed by hand, while the front headrests are embossed with the exclusive Trident logo. 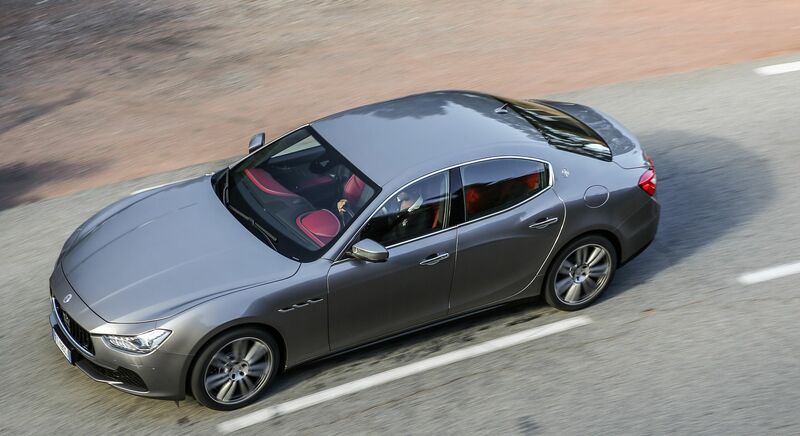 "Without question, the Maserati’s strength is its dynamic handling — possibly the best in the segment. Drive it hard, I mean really hard, and it excels"
The Maserati S Q4 intelligent all-wheel-drive system keeps the performance and comfort of your Maserati Ghibli at their engaging, inspirational best—even when the weather and road conditions are far from ideal. A sophisticated algorithm developed by Maserati continuously monitors dynamic inputs such as wheel speed, steering and yaw angle, and even wheel grip versus driving style. Processing all this data, the Q4 system establishes a dedicated grip profile for each individual wheel. This helps ensure optimum handling dynamics and traction for any given road condition, at any time. The advanced design of the ZF eight-speed automatic transmission ensures precise gear changes and optimum performance, putting the power delivered by the Ghibli engine under your complete control. Through the use of auto-adaptive software, the transmission modifies its shift patterns according to driving style, for an even more rewarding, one-to-one driving experience. And when it comes to long, high-speed journeys, the last two gears, seventh and eighth, are specially calibrated to reduce fuel consumption and enhance comfort even further. Maserati Touch Control Plus (MTC+): the elegant display of the 8.4-inch MTC+ unit takes pride of place at the center of the Ghibli dashboard. Designed to be a simple, intuitive and responsive interface, MTC+ incorporates the Ghibli’s multimedia and cabin functions, such as seat heating, ventilation, steering wheel heating, etc. Apple CarPlay® and Android Auto™: the MTC+ supports the convenience of both Apple CarPlay and Android Auto mirroring functions1. Wi-Fi Hotspot: the Wi-Fi option is another welcome touch when you’re on the move in the Ghibli2. Harman Kardon Premium Sound system: this state-of-the-art entertainment system delivers rich and detailed sound quality, and features a 900-watt amplifier, a special high-performance subwoofer and 10 speakers with high-power handling capability carefully distributed throughout the cabin. Bowers & Wilkins Surround Sound system: this optional entertainment system features 15 speakers that include mid-range drivers and rear-woofers made from Kevlar®, each strategically built into the car’s architecture and powered by a 1,280-watt amplifier to deliver immersive sound for all onboard. 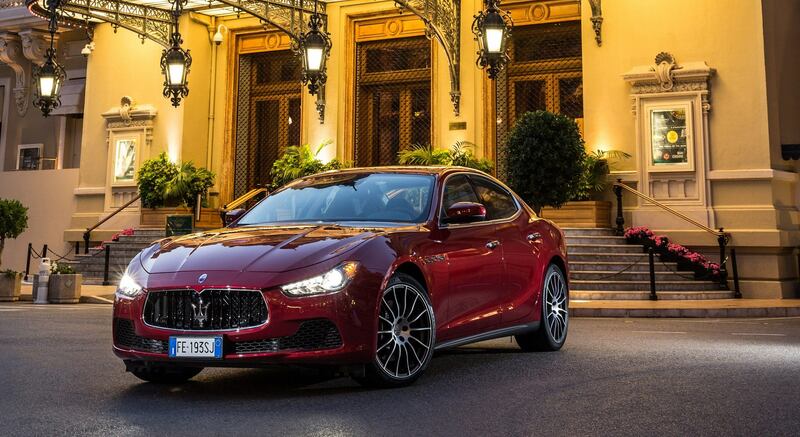 Maserati made safety a top priority when designing the Ghibli. So not only does it provide mile after mile of high-powered luxury, but it also has the full 5-star EURO NCAP safety rating. HAS combines the virtues of Adaptive Cruise Control with Stop & Go and Lane Keeping Assist to make highway driving easier3 . Using information picked up from a digital camera mounted behind the rearview mirror and a radar system in the front grille, HAS automatically keeps the vehicle centered in its lane, at a preselected speed and at a chosen distance from the vehicle ahead. It will even decelerate the Ghibli as traffic conditions dictate. To ensure safety, HAS requires the driver to keep his or her hands on the steering wheel at all times. This system, in combination with Adaptive Cruise Control, monitors vehicles ahead and warns if the approach could result in a rear-end collision5. This is linked to the Advanced Brake Assist system, engineered to provide additional braking during an emergency stop. If the warning does not prompt any action from the driver, the Automated Emergency Braking system automatically applies the brakes to reduce vehicle speed. LKA provides valuable input if the driver is about to unintentionally leave a lane3 . A digital camera behind the rearview mirror continuously monitors road markings to keep track of the course ahead. The instrument panel display shows the specific status of the vehicle. White lines on either side of the vehicle image indicate that it is safe in lane. One yellow line indicates that the Ghibli is moving off-centre, right or left. One flashing yellow line warns of lane departure. At that point, when the Visual & Haptic box is selected in the touchscreen display, LKA actively steps in with corrective steering torque. Activation of the turn indicator overrides the system. With this system, a warning icon appears in the exterior door mirrors when a vehicle enters the driver’s blind spot6. Three levels of support can be selected if the driver nonetheless initiates a lane change. Minimally, the system maintains the visual alert in the door mirrors; additionally, alerts are backed up with an acoustic warning. Or for maximum intervention, the system applies steering torque in the opposite direction of the attempted lane change. The intensity of this torque is also adaptable according to preference. Adaptive Cruise Control constantly monitors the vehicle ahead, maintaining a preset distance3. With the Stop & Go function, the Ghibli will also adjust to the speed of the vehicle in front until it comes to a complete stop, if the stop is less than two seconds. Even the best drivers fail to recognize traffic signs on occasions, and for this reason, Traffic Sign Recognition is a particularly useful feature4 . This system monitors three types of signs: speed limits, temporary speed limits dude to conditions such as heavy rain, and no-overtaking zones. It then displays the signs digitally in the cluster display of the instrument panel. The system operates with data acquired with a digital camera mounted behind the rearview mirror and from the navigation system. Rear Cross Path function is a useful feature that emits a warning signal when an unseen vehicle is approaching, from the right or left, while reversing out of a parking space7 .